Build strong management skills and independent living skills with this new comprehensive high school program. High school comprehensive course with emphasis on management of resources such as time, money, information and technology. Includes new content on teamwork and leadership, life-span development, and interpersonal skills. Offers flexible course organization so that teachers may choose Unit/Chapter sequence to fit course requirements. 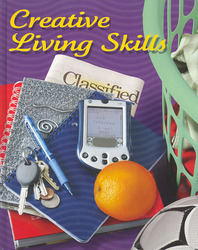 When used for a management or independent living course, may be paired with LIFE On Your Own, a worktext presenting real-life situations for students to practice dealing with them.